We’re nine years into the current bull market. When stocks go up for such a long period of time, it breeds complacency. It generates a feeling that going up is the new default. That it’s all been written down. But I’ve been thinking about change quite a bit this year. For one, interest rates are changing. The Federal Reserve just hiked rates to 1.75% and is promising a faster pace to rate hikes in the next year. The U.S. economy continues to change and improve. But quite a bit of that improvement has its roots in easy money and high levels of debt. It’s a situation that has to give sooner or later. The Trump tax cuts are another significant change. They are providing more pocket money for both consumers and corporations. But this improvement will hardly make up for the near decade of easy money Wall Street has become accustomed to. The biggest change so far, however, is President Donald Trump’s new penchant for tariffs … specifically on Chinese goods. Trade war rumblings have Wall Street investors on edge and sent market volatility soaring. From these developments alone, it should be clear that the nine-year bull market is changing. It’s no longer enough to invest in an index and ride the tide higher. Investor discretion is now advised. That’s not to say that the bull market is dead … far from it. There are many opportunities still out there. In fact, Ted Bauman and I outlined five trading ideas to take advantage of this change in the April edition of The Bauman Letter. Today, I’m going to outline another one of these pockets of strength in this changing market. It’s one that will endure and even flourish in these changing conditions. And it comes from the much-maligned oil sector. 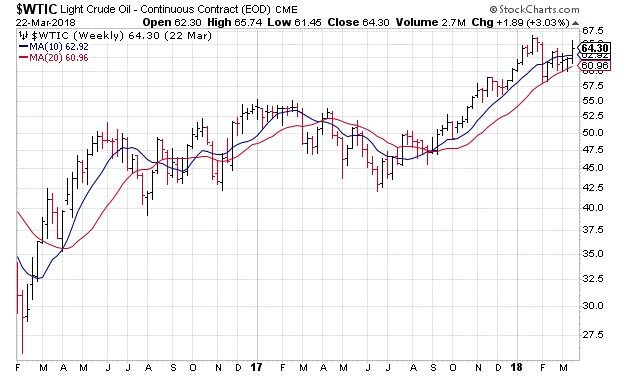 If you haven’t read Matt Badiali’s article on oil from last week, you are missing out. In it, Matt highlights one of the major reasons for the recent rally in oil prices … and it’s not just OPEC’s production cuts. The biggest reason is that the oil industry in Venezuela is collapsing, alongside the country’s political regime. In fact, Venezuela’s oil production fell an average 30,000 barrels per month in 2017. It’s taken a huge chunk out of global supply, one that even rising shale oil production in the U.S. is having a hard time keeping up with. Add in escalating conflict between Saudi Arabia and Iran in the Middle East, and we have the recent surge in oil prices. As you can see from the chart below, the price of light sweet crude has soared more than 140% in the past two years. This rally is just the beginning. As Ted and I detailed in the April edition of The Bauman Letter, rising interest rates and increased corporate spending should juice commodity prices even higher. Throw in the potential impact of Trump’s tariffs on the oil industry, and we have a near perfect storm for oil prices. Aside from investing directly in oil, there are several ways to take advantage of this situation. One of those is to look stateside at the booming U.S. oil market. EOG Resources Inc. (NYSE: EOG) explores for, develops, produces and markets crude oil and natural gas. The difference between EOG and many of its competitors is that the company’s principal producing areas are U.S.-based. EOG is focused heavily on production in New Mexico, North Dakota, Texas, Utah and Wyoming, with additional operations in Trinidad and Tobago, the U.K., China, and Canada. The heavy stateside focus is what gives EOG the edge we are looking for. It puts the emphasis on U.S. consumption, which is rising quickly, and allows investors to garner some shelter from the fallout of Trump’s tariffs. For 2018, EOG is looking at an increase in oil production of 16% to 20%. What’s more, the company is playing it cool this year by not investing all of its cash flow into drilling more wells. As a result, if oil averages $60 per barrel this year (which is a very realistic prospect), EOG would realize $1.5 billion in free cash flow. These solid fundamentals come with equally impressive price action for EOG stock. The shares are up roughly 20% in the past six months and have reclaimed key support at $100. Broad market volatility has had an impact, forcing EOG stock to back away from all-time highs. However, the shares have found solid support at their 200-day moving average. 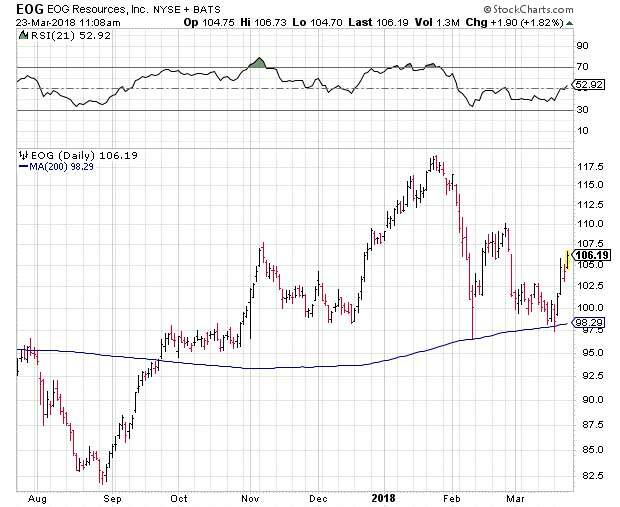 Despite the rebound from this trend line, EOG is far from overbought. The next significant technical hurdle lies at $110. Above that, $120 could create some turbulence. That said, EOG stock is a buy in the $105 to $110 range. If you are getting in, consider a stop-loss on a daily close below $100, as this could signal a shift in market sentiment. Editor’s Note: Bob Bauman’s Lawyer-Proof Your Life has been called “a comprehensive blueprint” for financial survival in the hostile, lawsuit-happy environment we live in. Spend just one morning with this book, and you’ll see exactly why it’s an indispensable guide to navigating the American legal system. To order your copy now, click here.